J. Crew tartan shirt; Gap quilted jacket; Paige verdugo jean leggings; Hunter 'Regent Apsley' boots (c/o); vintage Persol sunnies (similar). I'm also having a serious moment for tartan plaid, guys. Preppy yes, but also a little more city-friendly than a buffalo check or western-inspired plaid. I scooped up this J. Crew shirt for The Hunt, which was sort of an impulse (read: panic) purchase, but one that has served me well in the aftermath. All in all, this is definitely a lot of navy, and I like it. Oh and the boots - the boots! I did a fun styling project with Hunter Boots for Eat, Sleep, Denim (coming soon, y'all) and I fell hard for these uber-equestrian boots in the process. Throw it all together and I'm basically one mini-van away from picking up the kids at lacrosse practice, wouldn't you say? But, in a good way... right? *Also, if you think I wasn't listening to this Eurythmics song the whole time I was writing this, think again. Those boots are great! 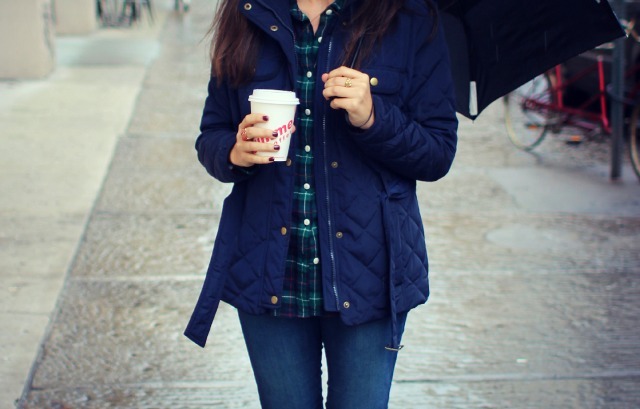 love the rainy day ensemble. I never look cute on rainy days, ever! Where's that umbrella from?! I'm in serious need of one. Love your outfit especially the shoes! 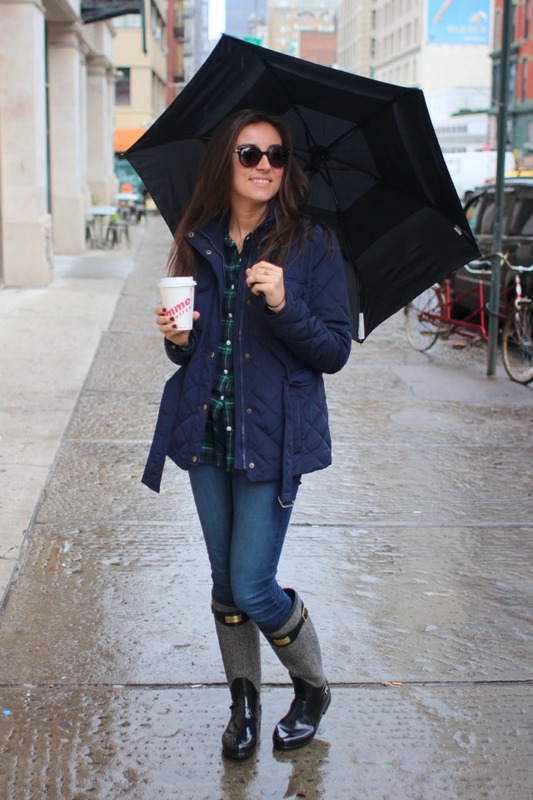 This outfit is simply perfect, love the hefty dose of prep! Cute look! Loving your shirt and boots! So fun! Taylor, I've read so so many of your articles on IFB, and without sounding like a complete cringe, you have inspired me so much to keep going with my blog. I think actually, that you are living my dream life at the moment! I've just graduated from studying fashion, re-started my blog (seriously this time), and my aim is to get a work placement in New York (after my exciting internships in London!) IFB is probably the best thing thats happened to my fashion existence! P.S it also helps that I absolutely love your style! Since you obviously couldn't even come up with an original blog name. I mean really it's, "OMG, I love that SKIRT on you." Get it right ho!